In Canada, there are now three professional associations that certify the boots on the ground in our industry, but we are an industry first. 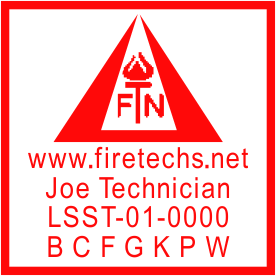 The Fire Technicians Network provides Professional Certification for fire protection equipment service technologists and specialists in Canada and represents the Gold Standard of professional practice in the testing, service, maintenance, and installation of building life safety equipment and systems. So what exactly sets us apart? We’ve significantly raised the bar in how we approach the way we monitor our technologists training and practice. While we will always respond to complaints or concerns expressed by building owners (and from the Authority Having Jurisdiction), we also rely on a number of other cues and processes, unique to our association, that ensures our member’s professional conduct and practice remain in full compliance with local Codes, the relevant Standards, and the expectations we have of them (as expressed in our Code of Ethics and Conduct and our Professional Practice Guideline). There simply isn’t a programme of its kind anywhere else in Canada (or North America for that matter). Our technologists are uniquely poised to take on the challenges presented by our 2015 National Building and Fire Codes (as adopted by your provincial authority). In point of fact, our technologist members represent the apex of the fire protection service industry. Does the association develop the training curriculum? Does the association deliver the training (either in-house, on-line, or through association employed training facilitators)? Does the association maintain an online component of their training curriculum? Does the association provide the means to evaluate technician competence through hands-on practical testing? Does the association develop the certification criteria? Are technicians required to achieve a minimum number of professional development hours? Does the association require technicians to undergo formal Practice Reviews? Does the association monitor their technician’s activities? Are the professional development hours required for annual requalification? Are technicians required to log their daily activities? Are technicians provided with a resource to obtain answers to technical questions that may arise during an inspection or test? Are technicians provided with report forms formatted to the requirements of their jurisdiction? Does the association maintain a Professional Practice Guideline? 1 CFAA produces a fire alarm technician training course, but relies on other training providers to deliver it. 2 CFAA offers their fire alarm technician training curriculum as a correspondence course. 3 Both ASTTBC and the CFAA will review a technician’s practice as part of an investigation resulting from a formal complaint filed against the technician. ASTTBC conducts random Practice Reviews on a very limited basis. 4 ASTTBC released their new Standard of Practice (SoP) in December of 2018.